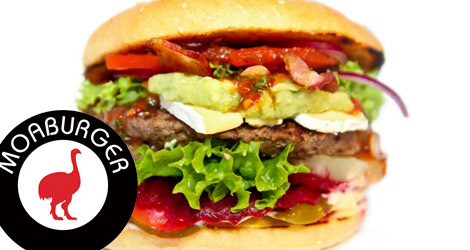 The idea of gourmet burgers is relatively new in this country, where a scorched sausage in a bun is the height of fast-food sophistication, but if MoaBurger can’t re-educate the nation’s taste buds, nothing can. I don’t want to give the impression that there’s anything‘delicate’or‘fancy’about MoaBurger’s menu – it’s not that kind of place. If you just want a burger the size of your face to fill a cavernous hunger, you will not be disappointed. The difference between the Moa experience and a homemade patty slapped in a supermarket bun is that the ingredients are tip top and the guy in the back room flipping the burgers is a massively experienced and highly trained chef. Owners Nick and Patrycja Eltringham worked in some of the world’s great restaurants before settling in Poland and opening MoaBurger. Nick is from New Zealand (hence the restaurant’s name) – a nation that knows a thing or two about good meat and fresh ingredients. Moa’s Classic burger weighs in at 17zł, and is more than substantial enough to satisfy a mortal appetite. For truly epic hunger pangs, order the Mammoth Burger for 28zł and get to work on a double patty along with two of every extra you can imagine. The chips, by the way, are worth a trip on their own. Just go. The burgers are incredible!